I have had a massive stack of magazines piling up ever since school started. All of my favorites have been pushed to the side in favor of more scholarly reading 🙂 Think textbooks over Fitness, Health, and Shape! But I’ve had some time over the past few days for a little leisurely reading and you can bet I took full advantage. Do you think a magazine should maintain its ideals 100% or is it okay to have ads that contradict what the magazine is trying to promote? For example, a vegan magazine with an ad for an organic butter company or a health magazine discussing safe ways to lose weight with an ad for diet pills. This trend even makes its way on to blog ads sometimes! Anyways, the reason I bring this up is because personally I think if the articles in a magazine are claiming one thing, then the ads that the magazine chooses to publish should match those opinions or at least support them in someway. As I’ve been reading I’ve noticed more and more the contradictory nature of magazine. Granted I know they have to make money and have to have to certain number of advertisements…but I think they should make the extra effort to find brands that fit the image they wish to promote. 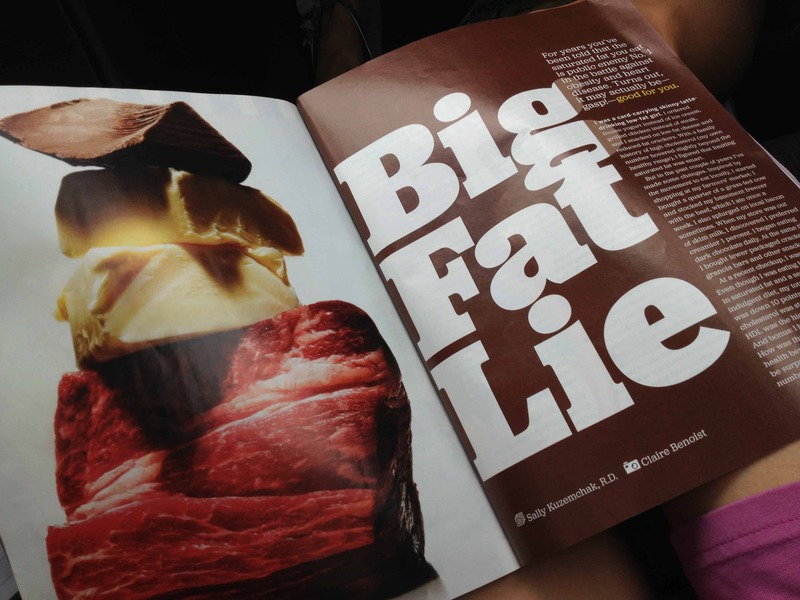 Most recently I was reading in article in one of my favorite magazines about how doctors are rescinding their previous claims that saturated fat is bad for us and how it is actually a very healthy source of fat (when consumed from natural sources!). 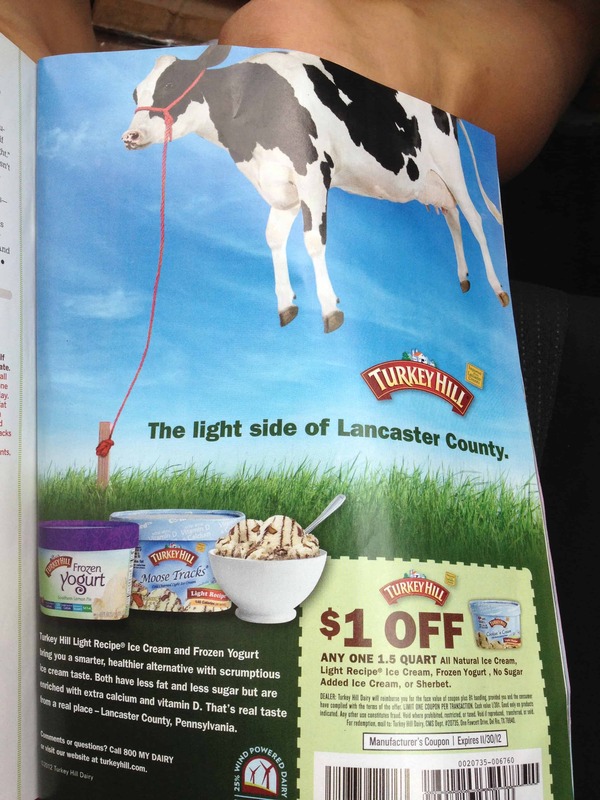 An ad for “light” ice cream! 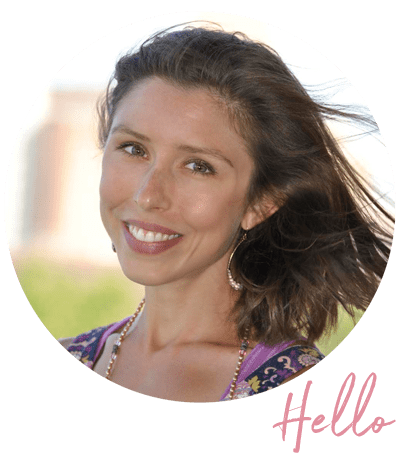 The article had just talked about how you’re better off having a small amount of the real thing made from a few simple ingredients, rather than something loaded with extra sugars and additives to make up for the lack of fat. Magazines seem to be walking the walk, but not talking the talk. Not promoting or practicing what they preach. I’m not saying that having a contradictory ad like the ones I mentioned above necessarily take away from the content of the magazine (heck, most people probably don’t even notice stuff like this! ), but for me at least it just irks me a bit. It makes me feel like the magazine either A. is more concerned with money than maintaining their values and message or B. don’t really believe in their content and are just choosing to discuss the hot topics of the present. The uptick in this trend is definitely going to make me a little more choosy when it comes to making magazine (or media in general!) purchases! Do you feel magazines or media outlets in general should only have ad campaigns that go along with their ideals? Do you even notice this or does it not bother you at all? Have a great day/night friends! Today’s Healthy Help: Cut my neighbors lawn after cutting my parents lawn! Had to use a push mower since our regular one was broken…it was kind of fun actually! Previous Post: « WIAW: Eating my way through samples! Oh my gosh, you are NOT the only one who gets bugged by this! Same feeling I get when a bodybuilding magazine talks about not taking shortcuts to burning fat and losing weight– about how a healthy diet is ALWAYS the best way to go– and then they have an ad for fat burner pills on the next page.. Like, REALLY?! Yep. Notice this ALL the time. Not much is going to change that. These magazines have a wide audience and so hold very few strong strong principles. Their values change based on the latest trends or info. So sad that that is the reality of todays society…no one stands by their morals anymore. this is the reason why i don’t waste my money on magazines… welcome to social media! Haha! Definitely true! They are a money drain! I HATE this so much!! It makes me want to go to the magazine editors and just be like “what the hell are you trying to tell your readers! ?” no wonder so people have so much trouble understanding what’s good for them! EXACTLY! Its so contradictory and hypocritical in a way! I read Oxygen, which promotes clean eating and a healthy approach to losing weight, getting fit, building muscle…but all the ads are for crap products that “zap” fat. Protein powders filled with junk. Get fit quick stuff that doesn’t make any sense in conjunction with the theme of the magazine. It bothers me so much. I FEEL THE SAME WAY! I have noticed that A TON in oxygen….very frustrating and misleading. I can’t stand when they do this! I feel like it happens a lot with the health/fitness magazines. I mean I barely look at the advertisements but when I do and I see that? It makes me not want to read! But… I need my elliptical entertainment haha! I’ve never actually paid any attention to that. But wow! I completely agree with you. It’s hypocritical and makes their credibility go down. What an interesting topic to tackle! I don’t really read many magazines, so I never noticed that! It seems that we live in a world of contradicting advertisements. As they say, believe nothing that you hear and half of what you see. This stands true to advertising!